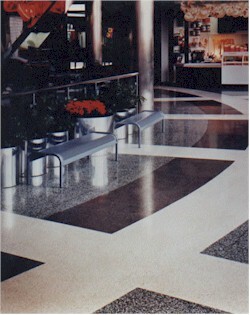 Fritz Industries has over 40 years of experience producing high quality, beautiful and natural,cost effective, marble and granite resilient terrazzo floor tile at high traffic areas for commercial, industrial, and residential applications. Fritz Industries also manufactures a complete line of associated products including underlayments for floor preperation, adhesives, and floor care. Fritztile's rich beauty and low-maintenance characteristics, not to mention its easy installation requirements and exceptional wear warranties, all combine to create a finish that is a perfect compliment to your design work.